Jim Paek's father told his son to finish his education when he signed his first pro-hockey deal. He reminded him again after he became the first player of Korean descent to win the Stanley Cup in 1991. He even repeated it after his son was named the head of South Korea's ice hockey program and before he passed away in 2014. "Before my father passed away, he said, 'Don't forget [to get your degree],'" the 50-year-old Paek told NBC News. In 1968, Bong-hyeon and Kyu Hui Paek left South Korea — which was still under martial law following the Korean War armistice — for Canada. One-year-old Jim Paek was their youngest. In suburban Toronto, it wasn't hard to get into hockey. His older brother Phil Paek played, so naturally, Jim Paek followed. They truly understood it was a way of growing as a human. Life skills. Leadership. Discipline. All those things that are important to life, I learned playing hockey. While the four-child household would produce a lawyer and a gynecologist, the Paeks also became a hockey family. Gathering around the television to watch "Hockey Night in Canada" became a family affair. "They truly understood it was a way of growing as a human," Paek said. "Life skills. Leadership. Discipline. All those things that are important to life, I learned playing hockey." But while Paek grew up Canadian, his parents made sure that he never forgot his heritage. "My parents always spoke Korean at home," he said. "We were raised in that Korean culture, mentality." Outside the house, however, Paek says he was pretty much the only Asian player at the rink. Opposing players and fans would occasionally try to goad him with racist taunts. "Initially, I tried to beat up everybody," Paek said. "But at the end of the day, it's how much you make out of it. So it's just water off a duck's back. "The more you make an issue out of it, the more it becomes a hindrance to what you want to accomplish," he added. According to Paek, hockey people have never judged him with prejudice, and he was a captain or assistant captain all through his junior and minor hockey career. In 1985, the Pittsburgh Penguins drafted the then 18-year-old defenseman. Eventually, Paek was assigned to minor league affiliate Muskegon to develop his game. There, he formed a life-long bond with future Penguins teammate Phil Bourque, now the team's radio color commentator. "He wasn't the most gifted, the most talented, strongest, any of that," Bourque told NBC News. "Maybe you'll beat him skill-wise, but you wouldn't beat his work ethic." Bourque also marveled at his friend's mental toughness. "I think because he had such a good foundation, family-wise, any of the racial stuff that crept in, he was able to deflect," Bourque said. "He never let it penetrate him." 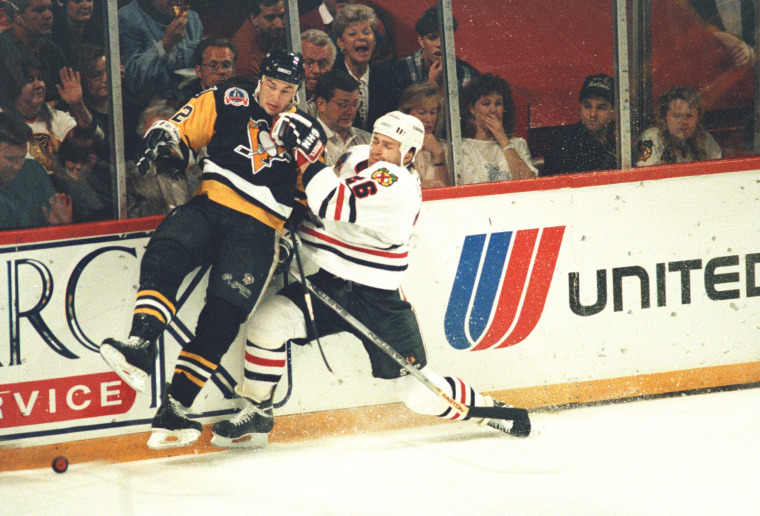 In the spring of 1991, Pittsburgh needed some stability on their blueline for the playoffs. They called up Paek, who had already starred in Muskegon for three seasons. Mike Lange, Pittsburgh's long-time radio play-by-play announcer, remembers the rookie well. "Jimmy was given his role by his coach Bob Johnson, and he just played it to a 'T,'" he told NBC News. "Jim was really coachable," NBC hockey analyst Pierre McGuire told NBC News. Even then, McGuire, who was a Penguins assistant coach, could tell that Paek had a future in coaching. "What stood out to me was his understanding of the concepts of the game. You could see that when he was a player," he said. The rookie was a vital cog on a squad headlined by Hockey Hall of Famer Mario Lemieux. Paek would raise back-to-back Stanley Cups with Pittsburgh. The significance of that achievement was not lost on the trailblazing defender. "When you look back at it, it's because you love the sport, it's not because you're Korean. But to be the first Korean. And people telling you that you're the first Korean. There's a sense of pride," Paek said. Twenty-five years after Paek's second Stanley Cup, the Penguins have once again won the championship, defeating the Nashville Predators. Seven thousand miles away, however, Paek has been clawing out smaller, but no less important victories. In 2014, South Korea tapped their native son to transform a men's ice hockey program that has never qualified for an Olympics into a world-class outfit by the 2018 Pyeongchang Winter Games. "I was so used to hockey being number-one on everybody's list [in Canada]," Paek said. "But there are other priorities in Korea." "We have just over 2,000 registered hockey players in South Korea. 46 rinks. Population of 50 million," he added. "So you see the ratio is not very good." Sports that South Korea has previously medaled in, like short-track speed skating, are showered with most of the available ice time. "Even public skating, [if] the rinks are city-owned...they take precedence over the national team," Paek said. But despite these obstacles, three years later, South Korea is at the doorstep of the Olympic dream. In April, the rapidly-improving men's national team was promoted by the International Ice Hockey Federation (IIHF), international hockey's governing body, to its highest tier. This means that at next year's IIHF World Championships, South Korea will finally be going toe-to-toe with the sport's giants, like Canada. And at the 2018 Olympics, South Korea's hopes to medal were boosted with the NHL's recent announcement that they won't pause their season for the Olympics. Fifty years after the Paeks fled South Korea, Jim Paek will be coming home for Pyeongchang 2018, though without his college diploma. But Paek doesn't think his father would mind: Bong-hyeon Paek also dreamt of the day that his son would represent their motherland. "The Olympics are a start of great things for Korean hockey," said Paek. "It's not the end."